Glasgow is well known for its trade and shipbuilding history and is also one of the largest seaports of Britain. 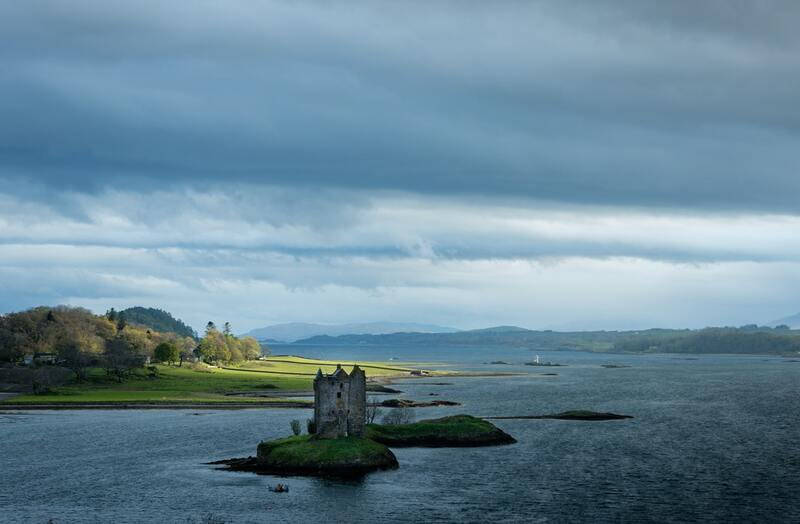 And don't forget some of the greatest architectural masterpieces and ambitious civil engineering projects can also be seen in Glasgow, making the city the perfect choice for your next business event. And for our music lovers, Glasgow was named UNESCO city of music meaning you will have the opportunity to discover one of Glasgow's hidden gems. So, here we are! We have selected nine of the finest hotels with exclusive meeting venues in Glasgow for your meetings and events. Will one of these venues be the ONE for your next event? Millennium Hotel Glasgow is located in the heart of Glasgow city, just beside George Square (only a 2-minute walk) and Glasgow Queen Street Train Station. Its ideal location will make strolling around the city easy, allow you to tour on a Hop On Hop Off bus and it will be the perfect occasion for you and your guests to sit on a bench with a coffee or tea and enjoy scotch pie. 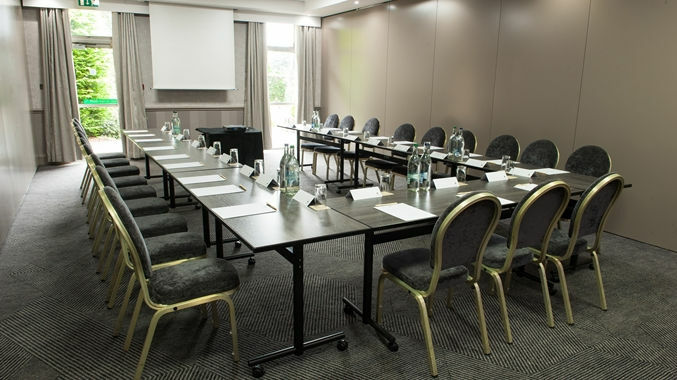 Millennium Hotel Glasgow offers 6 special meeting rooms with a maximum capacity of 40 delegates, including natural daylight and modern meeting equipment in all the rooms. These meeting rooms can be tailored to customers' needs and can be used for several types of events such as intimate sales pitches, corporate conferences or dinner parties. Novotel’s Glasgow Centre Hotel is situated in the centre of the city and is situated only 5 minutes of walking distance from Charing Cross Station, allowing guests to go on an adventure in the city. During your stay, unwind for a few hours at the modern gym or enjoy the panoramic views the venue has to offer on the rooftop. Surrounded by many local attractions such as Gallery of Modern Art and the Kelvingrove Art Gallery and Museum, we will guarantee your to see-list will definitely keep you busy. Novotel Glasgow Centre hotel offers 8 modern conference rooms for your meetings and events. With their largest room accommodating up to 45 delegates and with a stand by Meeting and Events team, you have all the needed ingredients for a successful meeting. This 4-star hotel is situated in the centre of Glasgow city and is surrounded by many top local attractions and places of interests: George Square and The SSE Hydro are only 18 minutes of walking distance from the hotel. You will find stylish rooms and the latest meeting technology. Glasgow Marriott Hotel comes with 15 meeting rooms with a total space of 18,396 sqft, welcoming up to 800 delegates. You will also find all the latest meeting equipment in each meeting room. DoubleTree by Hilton Hotel Strathclyde is a 4-star hotel which is only a few minutes away from Strathclyde Country Park, 12 miles from the city centre and just 20 minutes away from shops and museums. Guests can enjoy specially baked DoubleTree cookies on their arrival. Furthermore, the hotel's extensive leisure facilities include a swimming pool, spa, sauna and steam rooms, making sure you will find a way to relax after or if you prefer, before your meeting. Discover 6 flexible meeting rooms with a capacity of maximum 350 delegates. Guests can choose various types of package regarding different rates. In Renfrewshire, Mar Hall is a luxurious 5-star hotel with a wonderful golf and spa resort and located only 10 minutes away from the Glasgow International Airport. 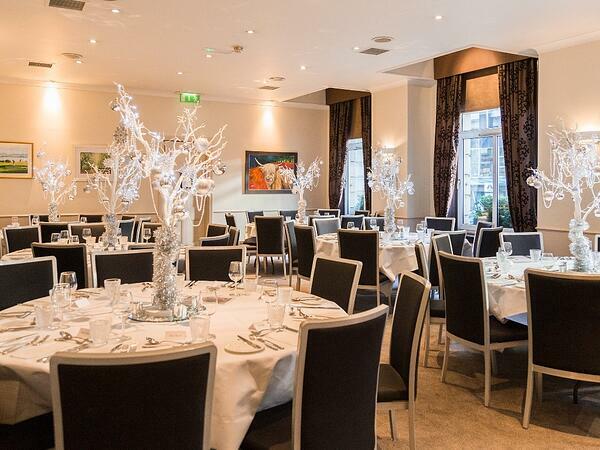 This venue is renowned for its luxury wedding venue and special Scottish conference room. Due to its ideal location, guests can visit Paisley Museum and Art Gallery which are both located nearby (only 7min') Mar Hall. You will be able to choose from 5 elegant meeting rooms for corporate use that will be able to accommodate a maximum capacity of 50 delegates. Not only you can organise your business meetings and events, but at Mar Hall you can also organise your team building event and rest reassured, with their wide conventional and out of the box ideas, your team building event will be remembered! Only 9 miles away from the Glasgow Airport and 2 minutes away from Buchanan Street. The hotel comes with stylish interior and wifi facilities. Guests can enjoy delicious food on their award-winning restaurant La Bonne Auberge. There are few local attractions around such as Kelvingrove Art Gallery and Museum and Riverside Museum which is only 30 minutes of walking distance from the hotel. This 4-star hotel comes with 4 flexible meeting rooms with a maximum capacity of 100 delegates. Time to unwind? Enjoy the delicious menus from the hotel's La Bonne Auberge restaurant, serving award-winning French and Mediterranean cuisine. Carlton George Hotel is a stunning 4-star hotel situated next to Queen Street Railway Station, but guests can also use a direct bus from the Airport to the hotel. This luxurious hotel comes with the amazing Waxy O'conner Bar, which serves the finest vodka, gin and whisky to guests. And when it is dinner time, creative Scottish cuisine from Window Restaurant will be waiting just for you. Carlton George Hotel is located close to local attractions such as George Square, the Gallery of Modern Art and various shopping opportunities are just a few steps away, so shop till you drop! The venue comes with a unique meeting room called Thomson Boardroom that can host a maximum of 12 delegates and offers all the needed meeting equipment. Last but not least, located on the 7h floor, you will have the chance to dine at Windows Restaurant, the venue's rooftop restaurant. Located in the city centre of Glasgow, this 4-star hotel is only 10 minutes away from George Square and Gallery of Modern Art and making it the perfect meeting venue for you and your guests when looking for a pinch of culture for your business event. CitizenM Glasgow hotel offers 5 elegant meeting rooms with unique designs, all equipped with the latest technology. The delicately designed meeting rooms will give you this unique and cosy atmosphere, making it the perfect choice for a relaxing ambient and informal place to meet. ABode Glasgow is situated in the heart of Glasgow, making it easy for guests to stroll around the city and discover the hidden gems of Glasgow. The hotel is decorated with a well-furnished interior with double gazed windows and wifi. Guests can easily reach places such as George Square and Gallery of Modern Art, which are only 10 minutes of walking distance away from the hotel. Furthermore, excellent public transport connections are just a few steps away, allowing you and your guests to get the best out of Glasgow. At Abode Glasgow you will have the opportunity to choose from 4 distinctive boardrooms for meeting purpose that can host events for an average capacity of 70-90 delegates. All rooms are well equipped with modern technologies. 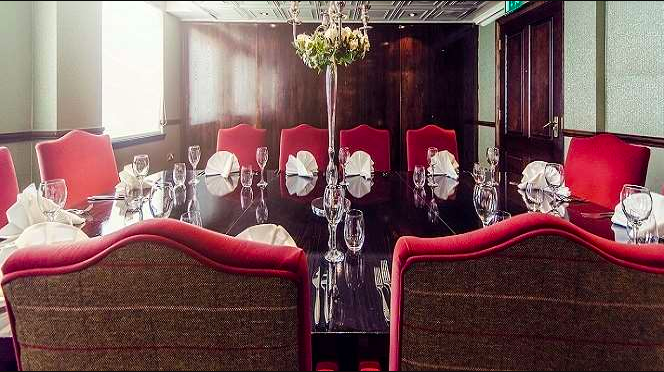 Whether you are looking for a formal business gathering or a cosy networking event, you can book the venue's Brasserie Abode for an exclusive event.